Written for CBSNews.com by Damascus-based journalist George Baghdadi. Syrians began voting Sunday in a nationwide presidential referendum to re-elect President Bashar Al-Assad who carried 97.29 percent of the last election in 2000. Some 12 million eligible voters from Syria's total population of 18.6 million are expected to cast their ballots at 1,087 polling stations which opened at 7 a.m. The voting, which will last for 12 hours, may be extended for three hours in case of a heavy turnout. The state-run Syrian Arab News Agency reported "massive participation" and said the turnout in all Syrian cities and governorates was "heavy and unprecedented." 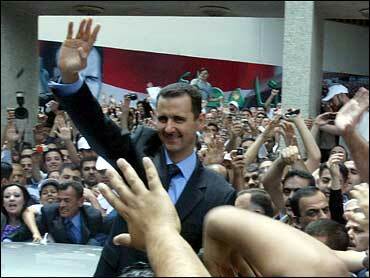 No opposition parties are allowed in Syria and Assad is the sole candidate in a "yes" or "no" referendum. It is an election Assad is sure to win. Many dissidents have condemned the process as undemocratic and said they will not take part. In 2005, delegates of Assad's Baath Party endorsed the idea of independent political parties and relaxing emergency laws, which have been in place since 1963. Those promises have yet to be realized. "Why I should go and bother voting where everything is pre-set. There is only one candidate and this is absolutely not a healthy process," said lawyer Haitham Al-Maleh, one of the few critics who still have the courage to talk to reporters openly after the government rounded up and arrested many in the last year. Interior Minister Bassam Abdul Majeed is due to announce the referendum result after the Syria's parliament, the 250-member People's Assembly, meets for a special session to approve the outcome of the vote. President Assad's current term expires July 17. Blaring horns, sirens, motorcades and rallies are the order of day and night. Syrians are staging massive daily exhibitions of fidelity and devotion for President Assad, who will start his second 7-year term. "Bashar, Bashar, Bashar," people yell as their cavalcades of hundreds of cars, snarl traffic in this city of five million. Everywhere you look there are colored lights and portraits of Assad – 50-foot-high canvasses hang from government buildings; poster-size pictures cover lampposts, hotel, lobbies and virtually every vehicle that moves. It is the same in every other city, town and village in Syria. The scale of this nationwide extravaganza lionizing Assad is unprecedented. The campaign kicked off when the People's Assembly unanimously nominated Assad for a new term and set May 27 for the referendum vote. Bashar Al-Assad, the 41-year-old British-educated eye doctor, took over as Syria's leader from his father, Hafez Al-Assad who died after three decades in power, in June 2000. Assad has kept the political system he inherited from his father largely intact and maintained firm control on power while slowly opening the economy after decades of state control. 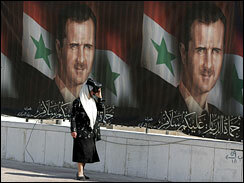 Syria has come under intense pressure from the international community over its policies, mainly in Iraq and Lebanon. Washington accuses Damascus of not doing enough to stop cross-border infiltration of Islamic militants into Iraq and of meddling in Lebanese internal affairs, charges that Syria denies. Daily reminders of Assad's accomplishments have appeared in the official Syrian press: effusive editorials lavishing praise on the "loyal Arab leader who is dedicated to all Arab causes." Secretary of State Condoleezza Rice early this month with her Syrian counterpart in the highest-level meeting between the nations in two years - a gesture toward dialogue aimed at easing their numerous disputes. The talks focused on the war in Iraq. When the elder Assad died in 2000, negotiations between Israel and Syria had been suspended following a round of talks in Shepherdstown, West Virginia. The talks faltered because of disagreements over the scope of Israel's territorial concessions. A meeting between the elder Assad and President Bill Clinton in Geneva in March of the same year failed to revive the negotiations.